Forgot to ask the neighbours to your party? Worried that you've committed a social faux pas? 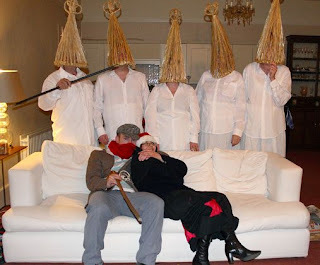 In Currane those uninvited will simply show up anyway while hiding their identities beneath hats made of straw. These 'Strawboys' are a rowdy lot, and they won't leave until you dance with them, an energetic process that involves plenty of alcohol refreshments. Apparently the Strawboys are so well disguised that you have to look at their feet to see whether they're male or female!